The Great Waterway Tourism Region is a travel destination that offers much more than you would expect. The region includes the unique towns, villages and cities of Cornwall, Brockville, Gananoque, Kingston, Belleville and Quinte West and is laced together by the sparkling St. Lawrence River, Rideau Canal, Bay of Quinte and Lake Ontario. The region hosts an abundance of natural, cultural and heritage riches that are a source of pride for the people who call it home. With pristine lakes, rivers, beaches and vibrant towns and cities, the curious day-tripper or couples and families looking for a special place to spend their vacation will have plenty to explore. Those who appreciate the great outdoors will fall in love with The Great Waterway. From the extensive network of walking, hiking and cycling trails that traverse the entire region, through to the abundance of water-based activities stretching from the Bay of Quinte along the St. Lawrence River through the 1000 Islands and up the Rideau Canal. During the summer months recreational boaters can navigate the original locks of The Rideau Canal, a UNESCO world heritage site that was built to connect the Ottawa River with Kingston when Ontario was known as Upper Canada. Artisanal foods and master chefs are peppered among the award-winning wineries of Prince Edward County. Visitors can join a wine tour and stop for a tasting along the Taste Trail or shop for local arts and crafts along the Arts Trail. You can get hands-on and learn how to make that special dish at one of the area’s renowned cooking schools. Visiting The Great Waterway engages all the senses with the regions distinguished master chefs, wineries, micro-breweries, organic farms, artists, and artisanal food producers. Heritage rich Kingston boasts a vibrant downtown with unique boutiques and countless eclectic restaurants and pubs. Visitors love to explore the city’s historic Victorian architecture, galleries, museums and historic sites or take a stroll along the waterfront and board a 1000 Islands sunset dinner cruise and experience the array of festivals and events in the heart of the city. The unique year-round festivals and events in The Great Waterway are a great centrepiece for planning a vacation in the region. The Great Waterway offers countless boat cruise opportunities and none more famous or remarkable than a 1000 Islands cruise. Tours of the 1000 Islands weave slowly among tree-topped islets and larger islands with cottages, private mansions and castles, some dating to the 19th century. You can explore small islands and private beaches while kayaking or boating through the islands or take the family camping at one of the many provincial parks or campgrounds in the region and explore the imposing dunes that rise behind a sun-lover’s beach of fine sand at Sandbanks Provincial Park in Prince Edward County. If you are looking for an incredible heritage experience, visit Upper Canada Village in Morrisburg. Upper Canada Village is a living, working, colonial town where 1860s pioneer life comes alive. Further down the St. Lawrence River you will find Fort Wellington in Prescott and Fort Henry in Kingston. Fort Henry was founded during the War of 1812 and still watches over historic Kingston, Canada’s first capital city. 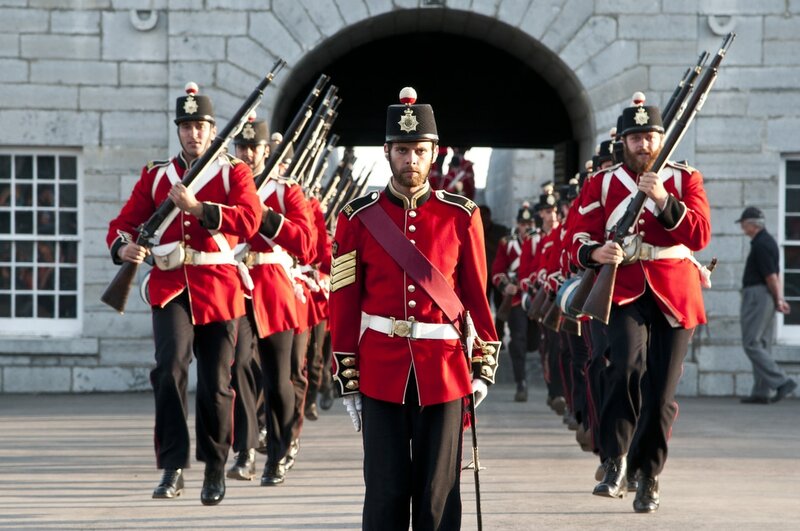 Perfectly restored, Fort Henry’s magazines and ramparts are brought to life by British soldiers in period costume during the summer’s Sunset Ceremonies. Step into the Fort Henry Discovery Centre and you are back in the 21st century with interactive exhibits and touch-screen technology that explains Canada’s early military history. More recent military history can be found at the National Air Force Museum in Trenton. Music and drama are thriving at venues all along The Great Waterway. The Empire Theatre in Belleville is housed in a converted 1930s movie theatre and the atmosphere matches the heritage ambiance of local restaurants and hotels. The Picton-based Festival Players perform a full summer season of great Canadian plays. Kingston is home to the newly restored Grand Theatre since its opening in 1879. The Grand Theatre has hosted a wealth of cultural events. The Thousand Islands Playhouse in Gananoque brings professional summer theatre to life. Set in a converted canoe club, performances share the magic and warmth of a unique heritage venue. The Brockville Arts Centre combines history and heritage with entertainment for modern audiences. Prescott’s St. Lawrence Shakespeare Festival is the only professional outdoor theatre in the region with a unique riverside setting combined with high quality performance creating an intimate and memorable experience. Further East, Morrisburg’s Upper Canada Playhouse stages an annual calendar of critically acclaimed productions. Cycling in The Great Waterway is accessible for every skill. Criss-crossed by well-defined routes and rolling hills, it’s easy to go at your own pace while visiting the areas attractions. Thousands of miles of country roads, dedicated bike paths and our Great Waterway cycling itineraries make exploration easy. If golf is your summer sport of choice, The Great Waterway is home to courses for every skill level and offers everyone from the ardent devotee of the game, to the recreational golfer, some of the most spectacular vistas and terrain. Your golf experience will be well above par.